Back in 2015, we released a post entitled, "6 Reasons to Date a Physical Therapist." It's one of our most popular articles, and for good reason! 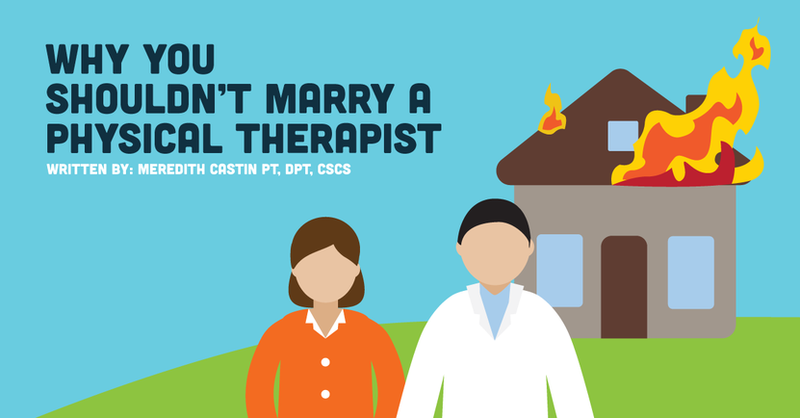 Yes, there are a few reasons why you shouldn't marry a physical therapist. It's not that we're trying to rain on your parade or prevent you from eternal happiness with your Schnookums. It's that we're trying to protect you. Here are a few reasons why marrying a physical therapist can be the worst thing that ever happened to you! And if you choose to proceed with your ill-advised plan...don't say we didn't warn you! 1. They’ll be silently judging your gait and body mechanics...for life! PTs are masters at spotting gait dysfunctions. Even when we're trying to relax on a day off and not think about PT, someone will stride on by, piquing our interests and sending us into gait analysis mode. And we'll call you out on it. In front of all your friends and family members. Why? Because it's fun for us to mock your feeble attempts at a swagger! I mean, uh, because we love you! 2. Think you’ll get free massages? Think again! You might be contemplating marriage. After all, you're dating a super attractive physical PT with hands of steel! And those hands of steel can sure take the edge off a long day. Did you know that the cost of physical therapy school is increasing incrementally each year? Whether your Schmoopy makes bank or not, those loans aren't going away on their own. That means that your PT husband or wife's debt will become your own. Lucky you! 4. They’ll always be hustlin'! This brings us to point #4. In order to pay off said loans, PTs must always be hustlin'! Whether they're talking about trying out travel physical therapy or trying to land side gigs and extra per diem hours, PTs are constantly living a hustlin' life, leaving you precious little time to spend gazing deeply into each other's eyes. 5. They spend their days touching other people! And that brings us to point #5! For every sweaty foot your precious Schmoopy touches, he or she will also touch an inner thigh that is much more supple and enticing. Even the most loyal of physical therapists will occasionally find a patient attractive. Is that really something you want to deal with in your future spouse? THEY SHOULD THINK OF YOU. AND ONLY YOU. 6. You’ll hear some pretty gross stories…during mealtimes. We bet you had a pretty disgusting day at work when your coworker sneezed into his hand and then used your keyboard! Ew! I've had multiple patients poop on my shoes. When I worked in outpatient ortho, a patient pooped on the gym floor. I have had MRSA pneumonia coughed into my face before it was diagnosed. I once straightened a patient's bedding, causing a cloud of cellulitic skin flakes to sail upward into the air. One said skin flake landed in my eye. MY EYE. I spent Valentine's day of 2014 in employee health, having cellulitis flakes flushed out of my eye. Those are just a few of the battle stories! Not every PT shares their tales of woe, but most of us do. And don't think that your forkful of meatloaf is going to keep us from discussing faeces at the dinner table. 7. Good luck being a couch potato! It's been a long week, hasn't it. You probably want to kick back and lie around a bit, soaking in your free time and enjoying some Netflix. Think that's going to happen when you're married to a physical therapist? Not likely! Nope, we're too aware of the effects of a sedentary lifestyle, and we're terrified of ending up like our patients: riddled with conditions that were preventable by simply getting up and moving around. 8. You won’t get much sympathy when you’re injured or sick. Feeling a little under the weather? I bet that sweet physical therapy spouse of yours would just love to make you some soup and bring you magazines on the couch, right? PTs have seen some serious business, when it comes to illness and injury. Your rolled ankle won't get you much more from your PT spouse than an ice pack, a few exercises, and a guilt trip about not doing some pull-ups to keep your upper body strong. Don't marry a physical therapist!